The Vikings are more popular than ever. TV shows such as Last Kingdom and Vikings have added dramatic license to particular historical accounts, while new archaeological finds are guaranteed to make headlines. Recent coverage includes the discovery of a new Viking ship burial, and the possibility of Viking women participating in warfare. But when we talk about the Vikings we often repeat familiar narratives of warriors, ships and battles. Certain activities and spaces – often those traditionally associated with men — are seen as shaping the course of history. The home – traditionally associated with women – is seen as mundane and politically insignificant. But the Viking house was not an apolitical, neutral space. It was a primary stage for legitimising hierarchies in which some people were enslaved and left to dwell with cattle in the byre, while others presided in a high seat. It was a foreign world – we have rare, but repeated evidence for infants being buried by hearths, magical artefacts placed by doorways, and women lifted over thresholds so they could speak with the dead. I want to radically shift our approach to this pivotal period of European history. 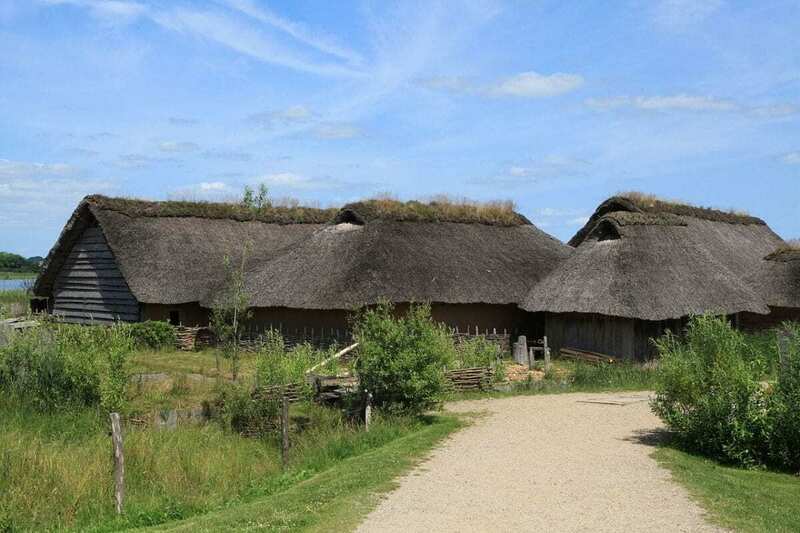 What happens if we see the Viking Age from the point of view of the house? For all their visibility in pop culture, everyday life for the Vikings is rarely seen, and settlements are often approached as familiar, harmonious — and perhaps a bit trivial. Now a wave of research is raising new questions about the everyday social and ritual lives of the Vikings. Gathering together the archaeological remains of longhouses from Norway in research for my book, Architecture, Society and Ritual in the Viking Age. Doors, Dwellings, and Domestic Space, revealed something stranger and more powerful than traditional narratives may suggest. The Viking household, while varied, did not conform to the idealised nuclear family of Western modernity. The largest households could be composed of a couple, concubines, subordinates, farmhands and warriors, animals, itinerant workers, guests, and a range of “mine, yours, and our” children. Although they lived under one roof, everyday tasks and the architecture itself created thresholds between groups and made people different from each other. “Slavery” is a complex institution, and a universal definition is difficult. But there was an unfree population among the Viking household (“thralls”) who had no legal rights, whose children were owned by the household leaders, who it was not a crime to kill, and who could be sexually exploited by their owners. Scholars have argued that the thralls dwelled in an extra room with a hearth in the byre (cowshed) end of the longhouse, spatially and socially belonging with the animals. Indeed, one of the known thrall names is Fjosnir, “of the byre”. In these ways and more, Viking houses generated contrasts between owners, free people and thralls – and such differences formed Viking society. The Viking house was not exclusively the domain of the living. In the sagas of the Icelanders, we encounter the malicious man Hrapp. On his deathbed, Hrapp demands to be buried in the doorway to the fire hall: “Have me placed in the ground upright, so I’ll be able to keep a watchful eye over my home.” The agency of the dead did not necessarily dissipate at death and the sagas are full of tales of people receiving prophecy from the dead, the dead singing in burial mounds, or haunting their old houses. Archaeological material supports the idea that the dead had a presence in Iron and Viking Age houses. Throughout the first millennium, human bones were sometimes embedded within the house, including infants buried in hearths and postholes. It must have been meaningful for people to place body parts of their dead under the threshold or in the postholes of the longhouse, or to inter the dead in the house when they abandoned the settlement. There is a clear ambiguity to dwelling with the dead. On the one hand, people sometimes kept the dead close, embedding them in the living space. Infants and ancestors may have helped protect the house, anchor it in local histories or empower its residents. On the other hand, Hrapp’s story and other sources suggest that the dead could be objects of anxiety. If they became malevolent, they could threaten the household – and so the threshold to their world needed to be controlled. Different parts of the house likely served as points of contact between living and dead, perhaps also among the past, present and future. Perhaps unsurprisingly, the foremost was the actual threshold to the house. Two written sources tell the narrative of a woman being lifted over a door to see into a different realm. One is an eyewitness account of a ship burial on the Volga River, where a slave woman is lifted above a freestanding portal (much like a doorframe). This allows her to speak with the dead chieftain. The other is an obscure text about a ritual gone wrong, where the lady of the house asks to be lifted “over hinges and door-beams, to see if she can save the sacrifice” — perhaps to see into another realm or into the future. The door could thus be a portal to other powers and beings. Perhaps for this reason, freestanding portals were sometimes erected at Viking burial grounds. Archaeologists also find things – such as pots, knives, and iron rings – buried in or near doorways. Perhaps these objects guarded the house from powers and beings from outside. And the depositing of artefacts simultaneously forged and embedded a link between people’s daily lives and their houses. It is even possible that artefacts would come with new inhabitants from older houses, for example when they were married. These would be placed in doorways or postholes to empower the house and tie people and houses together across time and space. Taking everyday life seriously opens up new possibilities to understand how and where history happens: it is not only on the battlefield. Architecture and the house mirror, as well as shape, social and spatial order. In Viking Age Norway, people were made to be different – owners and thralls, men and women, with different kinds of power and different things to fear or hope – through byres and high seats, feasts and rituals, doorways and deposited items. Viking houses were spaces of politics, and also social worlds that were very different from our own. When the Vikings engaged with the wider world through raids, trade, and settlement, their understanding of the world was anchored in their everyday experience in the home from childhood onwards. The time is ripe to broaden the topics we associate with the Viking Age, and to discuss the unfamiliarity and strangeness, as well as the role of inequality, in this pivotal period of European history.